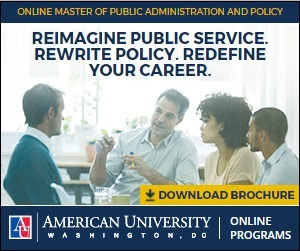 Search over 500 different accredited Masters of Public Administration degrees online or on-campus and learn how you can engage in a career in the public sector, within government, at non-profit organizations, or within the public or private public administration industry. The MPA is a growing degree for current Bachelors degree graduates that are looking to advance their career. Get started using the below quick navigation to find an MPA program. Public administration is a field that requires professionals to analyze situations and create solutions for contemporary and prospective challenges society has to deal with. In this field, you can work to help tackle problems faced by your community, or you can work towards solutions for global issues, such as HIV, poverty, and situations that plague underdeveloped nations. If you have always wanted to work in a field like healthcare, that makes you feel good about what you're doing in your professional life, then you may want to consider a career in public administration. The most common degree to work at government entities, nonprofit organizations, or private public administration companies is the Masters of Public Administration degree. Many MPA graduates choose political science as their undergraduate degree, since public administration Bachelors degrees are difficult to find. Other MPA students study sociology, pre-law, public policy, or other similar governmental-related degrees like criminal justice. check_circle Online GRE Waivers available Complete in as few as 18 months, includes a Practical Work Experience practicum at a public service organization. 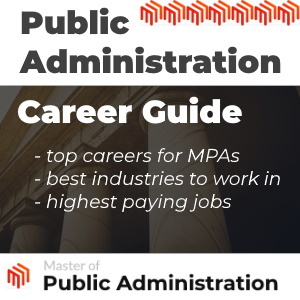 The MPA is a growing area, and with over 500 different Masters of Public Administration degrees in our directory, we are the top MPA degree guide on the web that is solely dedicated to graduate level Public Administration degree programs. Click here to view MPA programs in your state, the Top Online MPA Programs, or the highest paying jobs in public administration. Throughout the website, you will find NASPAA (National Association of Schools of Public Affairs and Administration, the top accredited body at the public administration program level) accredited programs marked with a NASAPAA designation, along with general information such as the online or campus location, school enrollment, and average acceptance for different universities. We use a number of data sets, including NASPAA, IPEDS, College Scorecard, the BLS, US Census Bureau, and more to make our listings easy to use and direct. You will find that some programs have summaries - our goal is to review every MPA program online and write summaries on all 524+ Masters of Public Administration programs. Even though the occupational territory for public administration work is far-reaching, there is a common thread of decision-making and execution of public policy that is related to most jobs in the field. In other words, those who work in public administration typically have a hand in how government tasks and functions work, or they are in roles that execute policy. Some of the work of public administrators help keep local and state governments functioning. Others may help prepare for emergency events, or help create budgets, or design education guidelines for your state’s practitioners. As such a wide-ranging area, public administration is an academic area that offers graduates with all interests a path towards professional success. Even companies in the private sector rely on workers with public administration backgrounds to help influence public policy, make internal recommendations, and shape their business objectives. What Can I Do With a Masters in Public Administration? Unlike other career paths which are more straightforward, choosing the best professional path with your public administration degree can be a more complicated task. Because there are so many industries and occupations that relate to this field, you should do your research and talk to several schools about career paths their programs typically result in. The first thing you should do is narrow the scope of your ideal job. Is it in healthcare, working for your city, state, or the federal government? Do you want to focus on improving the quality of education and student performance in your community? Or would you like to travel to a variety of cities as a consultant that helps improve city services and community relations? All of these are types of careers you can pursue with a masters in public administration. Roles for public administration graduates can focus on budget and fiscal related issues. They can be related to law enforcement, non profit management and fundraising, utilities and waste management, urban planning, parks and recreation management, public affairs communications, and many others. 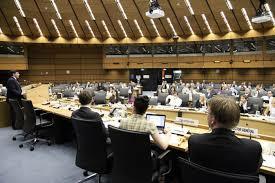 You can also use your masters level degree to enter doctorate level programs in public administration. With your PhD in this area, you can reach the highest levels in your career, while working as a specialist in the areas of public administration that interest you the most. Some positions in public administration work to further awareness for corporate social responsibility. These roles help businesses make a positive impact through programs for more sustainable practices and other initiatives. View the full Public Administration Career Guide. Thanks to innovation and the need for flexible graduate programs by working professionals, there are countless online options for public administration degrees, or the Online MPA. This is especially true at the masters level, where you can find accredited programs for students in all states. Still, it is always a good idea to look into your preferred career path to make sure you don’t require certain certification or state licensure to perform the occupation you want. While this may not be relative to most roles in the field, there are some careers in education and healthcare, particularly, that may have state-specific requirements to follow. It is a good idea to have your online (or campus) program is accredited by the National Association of Schools of Public Affairs and Administration (NASPAA). Most online masters in public health programs have a focus or option for development of leadership skills that are beneficial if you move into management or executive positions. The online format can make your learning more efficient. With the time you would spend driving to campus, you can spend focusing on your work. With the ability to access recorded lectures you can re-watch moments you missed while typing notes; which you can’t always do in large classrooms. Your one-on-one communication with your professors is typically very structured to give students the same level of attention they would expect in a face-to-face setting. 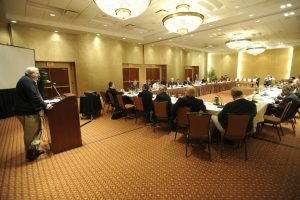 Like many other academic areas, there are different types of masters in public administration programs. Every school has their own unique curriculum, concentrations and specializations, types of lab and project requirements and so forth. Of course, there may be overlapping curriculum, this is another reason to look at several schools while you search. Some universities have schools of public policy or public affairs that work to shape the next generation of leaders in public administration, policy and related areas. You can find many top ranked programs that have online offerings as well. When you choose MPA programs, you will likely have choices for areas of concentration. These may include such areas as: local government management, public financial administration, city management, homeland defense, nonprofit management, policy analysis, and more. Policy analysis, is one of the common choices for those who want to help shape and improve public policy. The courses that define this program could help you understand the decision-making process, financial and possible political implications of policy work. The city manager concentration can help you learn how to become a strong, trusted connection between your community and the government agencies they rely on. In this role, you will have a voice in several areas, including budgets, policies and public relations matters. For those of you who are trying to determine which degree path is best for the career you want, might be asking yourself which is better for you: a masters in public health or a masters in public administration? These two degree programs definitely have their similarities, which is why many students compare the two. But there are key differences too; both of which we’ll outline here. First of all, a masters in public health is going to be focused on mainly health-related issues that may not be directly relevant to MPA occupations. For instance, you would likely take courses in healthcare systems, biostatistics, research methods, and ethics issues in public health. These are all topics you should be familiar with if you are going to be working in roles responsible for keeping people healthy. The masters in public administration, on the other hand, is more about organizational function, how things get done, how policy works – no matter what industry or type of public-related agency or organization we are talking about. The fact that these two programs are related is another reason why there are even dual master of public administration / master of public health programs available for students. The curriculum typically combines in-depth knowledge of health related topics with leadership and managing public policy decisions and processes. Students really doing their homework on degree programs and careers in public administration have probably come across masters programs in public policy. Again, these two programs often come up in the same decision-making process. But it is important to understand why these two programs are different. The major difference between these two types of programs is this: MPA degrees prepare students to manage others, oversee projects and budgets for local, state or federal government agencies. MPP degree programs are meant to help graduates work in roles that are specific to the nuts and bolts of public policy. Even though both graduates can work in public policy-making, it is the MPP degree holder that will be the one who evaluates the problem, interprets the data and is relied on to make recommendations for forward action. The public policy degree will also have a heavier emphasis on economics. The MPA program is basically centered on the ability to motivate organizations to move in the right direction. There are several other types of programs that fall into this area of interest for students. When you are comparing programs it can be hard to decide which one is right for you. That’s why you’ll want to think about your career outcomes when choosing any program to make sure the curriculum aligns with your aspirations. These programs are usually focused on political history with modern analysis for a full understanding of how political systems work and shape our world. Students also take courses that help them learn to look at data and make their own decisions and strategies based on their findings. Students generally take courses that focus on how people who work in public service can work as ethical leaders in their role. Graduates of Masters in Political Science degrees can pursue such roles as: city planner, congressional staffer, foreign service officer, lobbyist, political scientist, research analyst, corporate adviser, policy analyst, political scientist, and other related roles. Courses will typically involve American institutions, contemporary political thought, research and analysis, capstone project, global systems, and others. Like many other masters programs, you can earn your major in sociology in 1-2 years. These programs may involve coursework and field work meant to get the students out working in the community – just like they would in their professional roles. Some programs are designed around your masters thesis, which includes performing research, analyzing data and presenting your findings and recommendations to faculty and peers. With your masters in sociology you can prepare to teach at the college level, or pursue careers in the field. Those who graduate from these types of programs can go on to work as policy analysts, human resource managers, consultants, and work at social service agencies. After completing your masters in sociology, you can even earn your doctoral degree in this area and move into the top roles in the field. 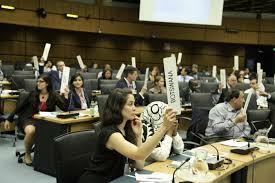 Public relations is an area directly related to public administration and policy. After all, government agencies and organizations that affect the public need to get the word out. When there are travel warnings, or threats of disease, illness, or other public health and livelihood issues, someone has to make sure these important messages are on point. When you earn your Masters degree in Public Relations you can open your career opportunities to public and private businesses. From corporations to marketing agencies, to mid-size and small startup companies. You may also seek teaching positions at the college level if you want to communicate your professional experience to students who are seeking the same kind of success you had in the field. A Master of Public Affairs tends to focus on helping students become leaders in all types of public, private and non-profit organizations. If you choose this degree program, your courses will typically focus on economic, management, critical thinking, leadership and other business related topics. Some programs offer internships at organizations that shape public policy in education, energy, low-income issues, and other challenges we face as a society. Students in these programs can also develop knowledge and skills in organizational dynamics, interpersonal skills, and social entrepreneurship – a topic of growing relevance in today’s startup culture. If you want to learn more about all these types of degree programs related to public administration, start by contacting schools in your area. You’ll want to compare campus and online programs. Sometimes there can be financial advantages to choosing one over the other. You’ll also want to know what kinds of career services each school provides as you move closer to graduation.